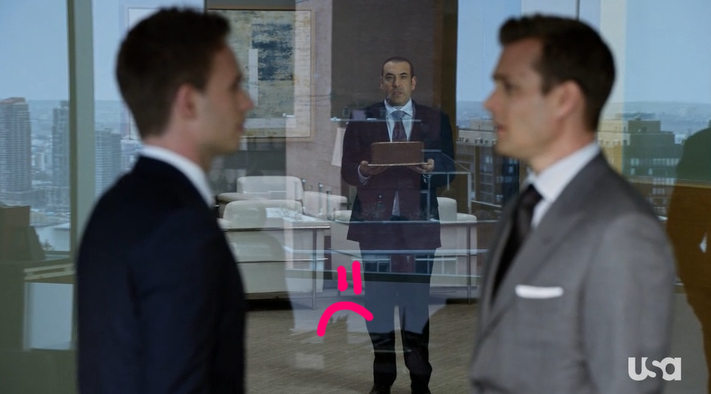 Last night’s episode of Suits was all about the endgame with the nerve wracking conclusion to the Ava Hessington case. Poor Lady Stark has been living with the worries of this murder trial and the possibility of going to jail for a very long time. She is finally a free woman!…thanks to Harvey. 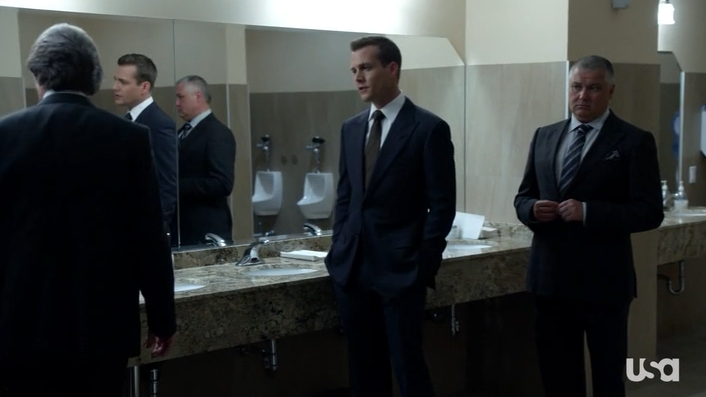 The episode starts off where last week ended…Harvey punching out Steven in the bathroom. Donna’s in Harvey’s office helping him with his battle scars…but she feels all better when Harvey tells her Steven looks even worse. 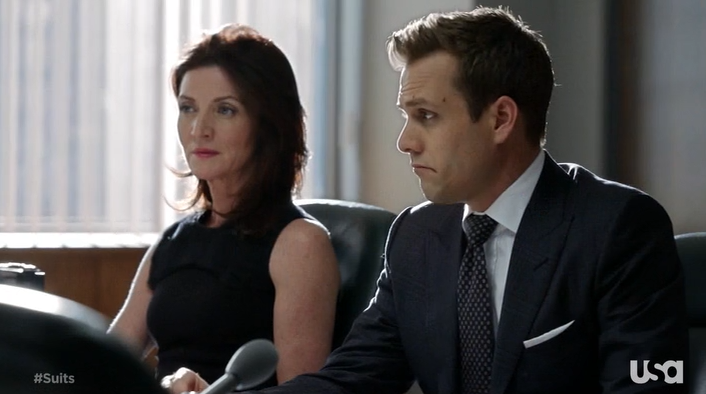 Donna begs Harvey to take Steven down…he promises he’s going to. But there’s a major roadblock…they don’t have proof that will convince Cameron…especially since the trial is a few days away. 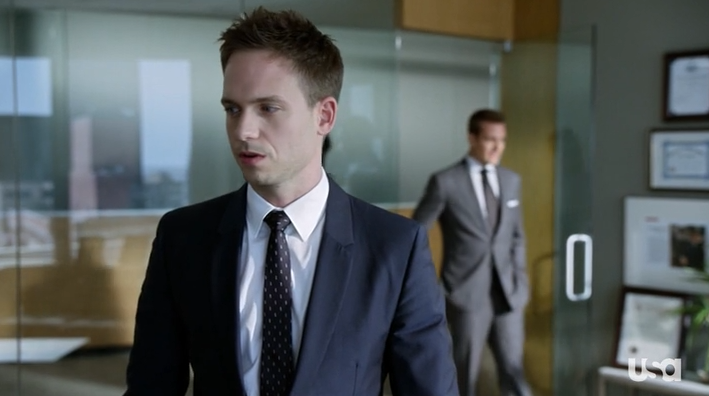 In court Harvey tries to bring Steven to the stand…he asks him a few questions and then lets Cameron do the dirty work. Only problem is, Cameron doesn’t believe Harvey and doesn’t really ask Steven any tough questions. All Cameron wants is a win…he doesn’t seem to care whose the guilty one. Meanwhile, Louis is having an all out war with Harold. He is livid with Harold for testifying against him in their mock trial. Harold has so much resentment towards Louis…and now there’s a lawsuit in the middle of them. Rachel has really become the voice of reason for Louis, the scenes they share together are special in that Louis always listens to her. He’ll put up a strong front at first…but she’ll know how to touch his emotional side…which is basically all of Louis. He is extremely emotional…and we see more of that in this episode. 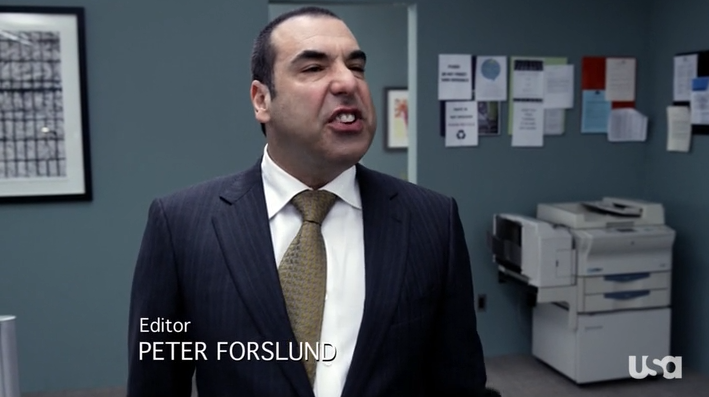 Rachel asks him why he’s being so mean to Harold…Louis explains that his pride and joy are the associates. He’s trained them and made sure they’re the best…except for Harold. Harold is a constant reminder that Louis failed at being the great teacher he thinks he is. Back to Harvey and Mike. Jessica has joined the team because let’s admit it…they need her help. Darby is in on the case as well as Ava’s fate is looking more and more tragic. At this point, Darby knows he’s the only one that can save her. He tells the gang he will testify in court and says he was the one who ordered Steven to handle the ‘business’. After he heard about the murders….Darby questioned Steven but obviously he didn’t tell him anything. It would still be enough for Cameron to let Ava go..and make a deal with Darby to take down Steven. And that’s exactly what they do in the men’s bathroom…minutes before the final hearing for Ava. Darby agrees to a few years of probation so Ava can be set free and Steven can take the fall. I mean he is guilty after all. Also, we learn more about the relationship Darby had with Ava and her father. He was in a relationship with Ava’s father…as an oil man he couldn’t come out of the closet…so any time he spent a weekend with Darby Ava would tag along and pretend to be Darby’s girlfriend. Welp, now we know the connection…and it’s totally clear why Darby steps in…although he didn’t have to wait to the last minute! 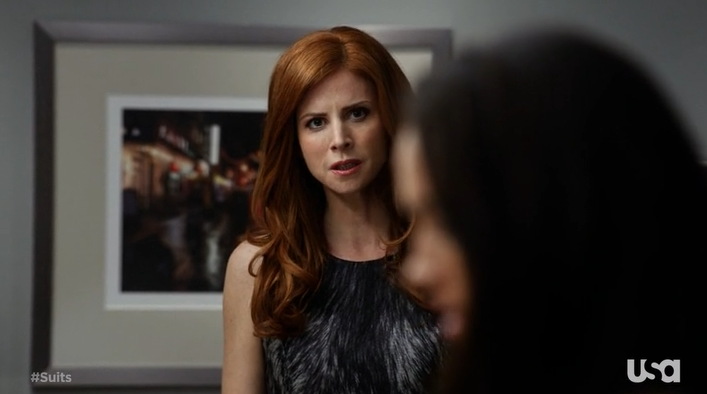 It was really funny how Donna kept ending up in the middle of things. She even made sure she was there at the bar when the FBI showed up to pick up Steven. Ouch. While Darby is signing the papers…he realizes there is a clause in the deal that forbids Darby of practicing law in the United States. This also means he cannot own his own firm…he looks up at Cameron Dennis…and then Jessica mentions that they wrote up the deal…and she purposely put that in there. Oh!! Jessica for the win! Darby doesn’t have a choice, he signs anyways…and this might be the end of Pearson Darby. Now that Darby and Ava are gone….will we see more cast members from the Game of Thrones? Check out the slideshow from last night’s episode below.